In our last article, we laid out five keys for Clemson to be able to pull out a win Monday night (now tonight); however, we didn’t go into how those keys would go. Here, we’ll do that. And in the end, we’ll let the chips fall where they may and choose a winner. In discussing this game on LSU message boards, one internet guru compared preparing for LSU like preparing for Ali or Tyson. You can spar with the best boxer in the gym, but it will never prepare you for Tyson’s uppercut or Ali’s speed. And until you’ve actually been hit by a heavyweight champion, you’ll never know if you’re really ready or not. Clemson must keep the tempo and yards flowing against this LSU defense, and the key will be first down. The issue is both Clemson and LSU understand this, so great emphasis will be placed on 1st down by both sides. In the end, Clemson will do what it takes to win 1st down, including trick plays, sweeps, roll-outs, etc... They won't always be successful, but the ones that are will set the Clemson offense up for points. Defensively, the key to the LSU running game is staying ahead of the chains. Positive yards out of the running game on 1st down sets up more rushes, and more body blows to a young Clemson defensive front. But the difference between LSU's philosophy on 1st down to Clemson's is LSU will stick to their bread and butter and try to out physical you. They'll occasionally sprinkle in some play-action passing to keep the defense honest, but 1st down will generally be the LSU running game against the Clemson defense - biggest and baddest man wins. In games against FSU & USC, Clemson had moments of brilliance on offense, and moments of utter ineptitude. They had the highest of highs and the lowest of lows. The highs were had to maintain and the lows hard to overcome. Against LSU, Clemson must find a way to combat both emotions as they will have offensive success and they will have offensive failures. Clemson, & Morris specifically, should have learned from both games, but similar to being physical, we'll never know until the game is played. But look for the offensive gameplan to be more diverse, imaginative, and consistent. If Clemson & Co. can stick with it, points will be scored. If LSU can force Clemson to draw even in 1-on-1 battles, they win. Clemson needs to have a few dominant performances by a few key guys. Either Watkins or Hopkins needs to find a mismatch they like and take advantage of it. The offensive line needs to find ways to keep Mingo & Montgomery out of the backfield. The defensive line needs to fight through blocks and the linebackers need to pursue and make tackles. Clemson has the edge on offense with their skill positions, but LSU owns both lines. 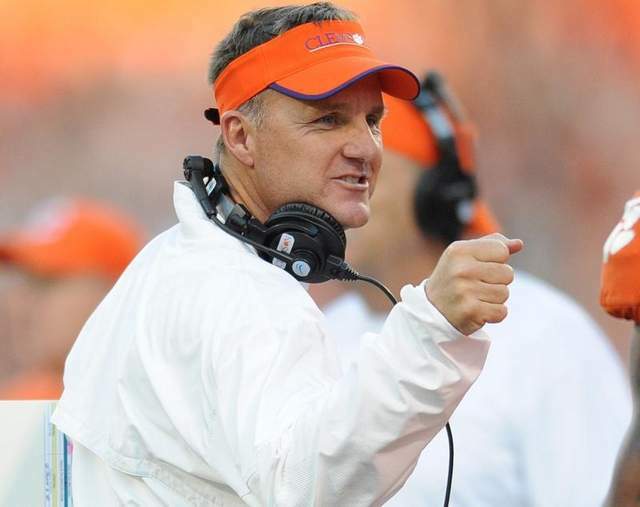 Can Clemson's advantages be large enough that it changes the way LSU plays the game? It's one thing to do it in the 1st quarter, but another to do it consistently throughout the entire game. In the end, I'm concerned Clemson can't win enough of the individual battles, or can't win them consistently, to keep LSU from wearing down the Clemson defense. No long punt/kick returns. No bad interception or fumble. No major busted play or defensive gaffe. LSU has made a living on swapping momentum on special teams or with a big defensive play. Can Clemson prevent that from happening? Not sure as Clemson is good for one crazy or weird play per game. How that play falls typically determines Clemson's outcome. The goal will be to break even in turnover margin, or limit where or how they occur. I expect Clemson to play conservative enough, or to minimize their risk, so this doesn't occur. As for the defensive gaffes, I make no guarantees. If you sum the keys to the game, LSU wins - handily. They will be the more physical team, they have better overall talent and will win many of the 1-on-1 battles, and will control the Clemson defense by sheer power and will. In return, Clemson will have some offensive success, stay the course, and not give anything cheap to LSU. But comparatively, the LSU advantages are greater, which will make it tough for Clemson to stay in the game. However, with that said, this is one of the better matchups for Clemson. The LSU offense uses very little misdirection and Clemson will be well rested from the break. As long as Clemson continues to play and fight, they will be in the game, with a chance to win in the end. LSU draws first blood with a field goal, but Clemson responds with a touchdown to take a 7-3 lead. The remainder of the half is back and forth as the teams trade field goals. Unfortunately, their early Clemson touchdown will be their only touchdown they are forced to continue to settle for field goals. However, the Clemson defense stands tall and keeps LSU within one possession. In the end, the LSU running game begins to find more success and LSU keeps Clemson at bay. It's been a while since The TigerSwag has seen new content. And for that, I apologize (though we've still seemed to add a few new twitter and facebook followers - THANKS!). I've never really done this before. Never followed a team, nevertheless my alma mater, and reported on their every moment. Never had blogging "deadlines", never had to make predictions and stand by them. Never had to write on demand. And when the season ended, so did I. Add to that a heavy work load at my paying gig, the Christmas season, and a recent bout of meh, and it all adds up to a quiet blog. And speaking of tragedies, to a much lesser extent, Elizabeth Merrill of ESPN recently wrote one of the finest articles I've ever read about the suicides of two USC football players - Kenny McKinley and OJ Murdock. Across message boards, you'll see folks try to pin these deaths on USC and/or Steve Spurrier, or they'll use it to belittle their school or program. It needs to stop. I'd love nothing more than to watch USC sink to back to mediocrity, but there is no way you can even link their program to these deaths. Only thing related to USC was their jerseys. But the one thing we can take from both of these stories is that people are dealing with stuff, and not in a very positive or beneficial way. We all need someone we can count on when times get tough and things go south. Because they always do, and they always will. We live in a world that is decaying and wasting away and full of sin. And until that is resolved, people will struggle. And as long as people struggle, there will be tragedies. May the next one be of much less impact to the innocent. Okay - enough of the downtrodden. Let me tell you what brought me back to the "typewriter": the Peach Bowl. Aka the Chick-fil-A Bowl. Aka, the meat of our SEC sandwich. As we get closer to the game, the excitement has returned. The pain of losing to USC is waning and the hope is waxing. My goal over the next 10-11 days is to put together one thought per day pertaining to the bowl game, culminating in our prediction of what will happen on that New Year's Eve. So, thank you for being patient with me as we transition out of the regular season and into the bowl season and basketball. Thank you for your support during the season. And thank you for the feedback, whether it be positive or negative. The ride so far has been amazing, and I'm looking forward to the next chapter. And regardless of what it brings, we can rest assured it will be interesting. I have never used this space to shill for someone, or something, other than my Clemson Tigers. But when a good friend looking for some help rings you up, you answer. And the info below is my best effort to help a brother in need. I have not received, nor will I, anything in return for this info, other than a thank you. Callaway Gardens is a 4,600 acre nature preserve located just 80 miles southwest of Atlanta. They boast three different lodging options and many onsite activities, including the gardens and golf, & adventures, including zip lines and boating/hiking. And just for the Chick-fil-A Bowl, they are offering a package deal that includes lodging, gardens admission, breakfast, and a welcoming gift. And even if you can't make it, feel free to click the link and show Callaway Gardens some TigerSwag love. With fewer games, there is little overall change. Alabama, Notre Dame, & Oregon remain 1-3, while Georgia falls from 4 to 7. Clemson holds pat at 10 while USC stays at 13.